Stories of the disenfranchised are still rare enough in contemporary American popular culture that it’s somewhat of a surprise when you get a chance to see them. As two new local theater productions show, that doesn’t mean all such stories are created equal. Plan-B Theatre Company’s short-play compendium …Of Color shows that all on its own, with four stories that convey non-white experience from a wide variety of perspectives and storytelling tones originating from the company’s Playwrights of Color Theatre Workshop. Iris Salazar’s American Pride sets a broad satire at a conservative talk-radio station during a hypothetical third term of the Trump administration; Bijan Hosseini’s The Frailest Thing presents a one-man recollection about a distant love story; Olivia Custodio’s Drivers License, Please sets up conflicts at a rental-car agency; and Darryl Stamp’s Roar observes an African-American stand-up comedian (Erika Ovuoba) whose life has been influenced by her contentious relationship with her alcoholic father (Brien Keith). At 30 minutes, Roar is the longest of the four pieces, and it’s perhaps no coincidence that it’s also the strongest. Ovuoba’s performance has a prickly intensity, and Stamp has the time to fully develop the push-pull dynamic on a young woman wrestling with where and how to follow in her dad’s footsteps. Yet there’s a much wider variation in effectiveness with the three 15-minute pieces. The Frailest Thing delivers a delicate sense of heartbreak through Bryan Kido’s performance and a general willingness to opt for an almost mythical quality to the storytelling. By contrast, American Pride and Drivers License, Please opt for some obvious swipes at contemporary racist/sexist culture, in ways that don’t always do the thematic material any favors. Even when it feels that American Pride might be trying to hint at the real horrors we can ignore when focusing on the buffoonish excesses of the American right-wing, there’s ultimately too much focus on those buffoonish excesses. Taking potshots at easy targets might be cathartic, but it doesn’t always allow for much insight. 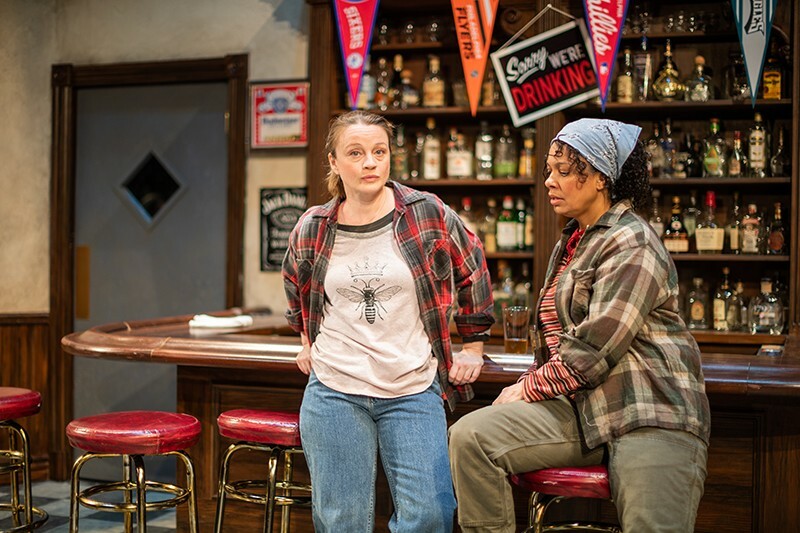 It’s not particularly fair to compare short drama to a Pulitzer Prize-winning full-length play, but Sweat digs into the reality of working-class America in a way that feels painfully real in capturing the lives of its protagonists. After a prologue that hints at a dark event to come, playwright Lynn Nottage flashes back to a neighborhood bar in Reading, Pennsylvania ca. 2000, where the regulars are almost all employees of a nearby manufacturing plant, including multi-generational workers Tracey (Margot White) and Cynthia (Nafeesa Monroe) and their respective sons Jason (Callum Adams) and Chris (Hassiem Muhammad). As the months go by—and Cynthia gets a promotion to a management position—it becomes increasingly clear that the plant might be considering changes that threaten the livelihoods of these characters. Nottage doesn’t over-emphasize her temporal setting, nor does she shy away from the impact of events like the passage of NAFTA on blue-collar American jobs. While we do get glimpses of the long-range impact of lost manufacturing jobs on Rust Belt America, Sweat is more interested in the psychology of people who start to see that hard manual labor has been devalued in this world. Even more significantly, the play emphasizes working-class people turning on each other—particularly seen in the simmering rage of Tracey, magnificently performed by White—in a way that seems too familiar in a contemporary culture that sees “others” perpetually blamed for circumstances instigated by people in power. By the time Sweat reaches its powerful final lines of dialogue, it has developed as a portrait of tragedy inflicted on people by an economic power structure more interested in giving them scapegoats than in giving them opportunities.